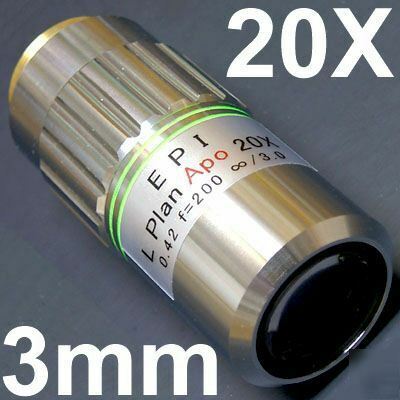 Super Long Working distance Plan Apochromat Objective, 20X, 95mm parfocal distance, infinity tubelength, 34mm diameter, RMS Thread, NIR transmissive, with 3 mm cover glass correction. Other correction values on request, please contact us. This is a new product with a 1 year warranty. For many applications this objective will work as a replacement for Mitutoyo part 378-824-4. RMS to Mitutoyo thread adapter is included. Many parameters like parfocal length, use of f = 200 mm tube lens, and outside dimensions match the Mitutoyo part while other properties are only slightly different. And you won't need to give up performance. Chromatic aberration is corrected for red, blue, and yellow by using an apochromatic objective lens as compared to a standard achromatic objective lens with correction for red and yellow only. Objectives are strain-free and optimized for bright field illumination (incident illumination parallel to optical axis), making them ideal for in-line illumination applications. Infinity correction is by way of a secondary or tube lens with a standardized focal length of 200 mm. Please contact us if you need help in selecting the right objective. This is a new part sourced directly from the manufacturer and comes with a 2-year warranty. In case you run into a problem contact us by email at support@ts.nu or phone , from outside the U.S.